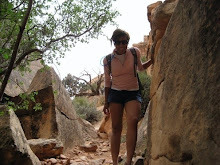 Green Fork Utah: How You Can Tell If A Mantis Shrimp Has Color Vision???!!! The FULL SPECTRUM OF LIGHT OR ELECTROMAGNETIC RADIATION is far wider than the narrow band of VISIBLE LIGHT which humans can see. Light consists of small packets of energy called photons that simultaneously act like waves and particles. Changes in the wavelength of light corresponds with changes in energy. We perceive these different wavelengths/energy-states of light as colors. Waves of light can be as long as several miles (radio waves, not to be confused with sound waves) or much shorter than the diameter of an atom (gamma and cosmic rays). Humans can only see light of wavelengths ~370 nanometers to ~700 nanometers (nanometers are billionths of a meter and symbolized as nm) although it varies somewhat between people and can be quite reduced in people with color-blindness where one or more of the main pigments are missing. Some birds and insects can see light waves as small as ~280 nm well into the ultraviolet range. Some other organisms can see things slightly into the infrared. Humans can only see the part of the light spectrum that we perceive as the rainbow of colors from red to blue, but we still feel infrared as heat and get a tan from ultraviolet rays. Scientists can study the range of light that different organisms see by biochemically analyzing the light absorption of different photo-receptors, chromophores, pigments, proteins, oils and other molecules in their eyes that affect the range of light and resolution of their vision. Two such applied methods are called spectrophotometry and electrophysiology. Some information can also be gleaned from DNA sequences as well. It is assumed that the light absorption properties of these bio-molecules reflects the range of vision that an organism actually experiences. Humans, who see from about 370-700 nm, have four main light absorbing pigments that are contained in 3 types of cone cells (absorption peaks at 437 nm, blue cone, 533 nm, green cone, and 564 nm, red cone) and 1 type of rod cell (absorption peak at 498 nm). These pigments are coded for in our genome. The cone cells help us see in color and the rod cells help us see contrast in black, grey and white. The figure below shows the light absorption range of these pigments and as you can see these pigments absorb light from about 370-700 nm. In other animals the number and absorption spectrums in their eyes may be quite different. Take a finch for example. We see that this finch has 4 main color sensing pigments with absorption patterns extending all of the way down into the ultraviolet. Remember that humans only have 3 color absorbing pigments and one pigment that helps us with contrast and can't "detect" color. If a human has 0,1 or 2 instead of the usual three cone cell pigments, they will be color blind maybe only seeing shades of grey, black and white...or maybe unable to see red and green or maybe some other combination of colors. So what does a pigeon see with 4 pigments? Do they see the world in more colors than humans? Are humans unable to see things in nature that other organisms can? And what do organisms experience for vision that have eyes with pigments that absorb into the ultraviolet and infrared? It is known in the case of some insect pollinators like bees and butterflies that they use ultraviolet to see flowers that are advertising that they want to be pollinated. Some flowers "glow" in ultraviolet and display patterns that are thought to lead pollinators to where the nectar is. When an insect gets the nectar and pollinates the flower, the ultraviolet markings often fade. This seems to help insects distinguish between flowers that have already been visited for nectar and those that haven't. Below are pictures of flowers in visible light (left frames) and in ultraviolet (right frames). Just like a person who is color blind will miss cues that are in color, humans are unaware of many natural signs because our senses don't allow us to perceive all that there is to perceive. I'm going to dig a little deeper into an interesting example of an organism with eyes that might very well see the world in details and colors we'll never even be able to imagine. It is the Mantis Shrimp. Yes they really are that colorful!!!!! Why did they evolve to be so colorful and why did such a complex vision system evolve in what humans would rather arrogantly consider such a simple creature? How does such an elaborate vision sensory system affect their world view? So many questions I have and not enough time to find out, but I will tell you a little bit about what I know about their amazing eyes!! 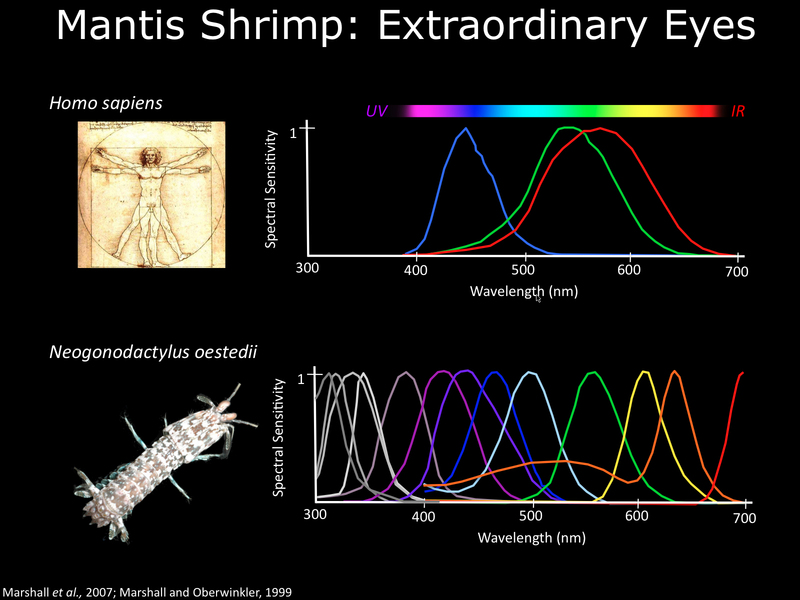 As of 2014, Mantis Shrimp are known to have at least 16 photoreceptor pigments in their eyes (compared to 3 in humans) with 6 absorbing in the ultraviolet range. This number is increased even further because some of the photoreceptor cells contain a variety of oil droplets (called cone cell droplets) that act like molecular filters that modify the range of light that a particular photoreceptor can absorb. All these components together allows them to see a wide range of colors and probably many more fine gradations of color than humans. It is also known that this array of receptors allows Mantis Shrimp to see linear and circular polarized light. For what purpose they have so many photoreceptor pigments is unknown, but very intriguing (not to mention the sci fi's that could be written about the mystical powers of seeing with 16 color absorbing pigments...perhaps you could see spirits.). Perhaps greater visual acuity is handy for surviving underwater or perhaps the Mantis Shrimp communicate through color signals. No one knows with any certainty right now. Mantis Shrimp, however, are made even more amazing by the fact that they have two eyes that are subdivided into 3 each. So instead of having binocular vision, they combine 6 images into one. What's weird about the molecular filters, which essentially increase the number of diverse photoreceptors in the Mantis Shrimp eyes, is that many of the chemical compounds are similar to ultraviolet "sunscreen" molecules that are present in other insect's eyes to protect them from ultraviolet damage. It would be like co-opting the melanin in our skin, which makes our skin darker to protect us from the sun's ultraviolet rays, to make sun glasses that help us see more colors than we would normally. Weird, right? And it seems Mantis Shrimp don't actually manufacture these compounds in their bodies, but get them from their diet and somehow the chemicals get absorbed through the digestive tract into the blood stream where they find their way to the shrimp's eyes. A good video about Mantis Shrimp vision can be found in the short video below. Osorio, D., Vorobyev, M., 2008. A review of the evolution of animal colour vision and visual communication signals. Vision Research. Vol 48, pp 2042-2051. Bok, M., Porter, M., Place, A., Cronin, T., 2014. Biological Sunscreens Tune Polychromatic Ultraviolet Vision in Mantis Shrimp. Current Biology. Vol 24, pp 1-7.